UNIONDALE, New York — Ringling Bros. and Barnum & Bailey Circus folded up its Big Top for the last time on Sunday night in New York, as emotional performers, wistful crowd-goers and ecstatic protesters said farewell to an institution in American live entertainment after nearly a century and a half. The circus gave the final performance of "The Greatest Show on Earth" to a sold-out crowd at Nassau Coliseum, showing off its death-defying stunts and exotic animals for the last time after 146 years. "Let's go home and show everyone we are forever more the Greatest Show on Earth!" Ringmaster Johnathan Lee Iverson said to close out the show, leading to a raucous standing ovation. Iverson then led the audience through one last rendition of "Auld Lang Syne," a tradition at the end of circuses, as performers sang along and hugged one another. "It has been the honor of my life to be the voice of these tremendous artists," Iverson said. Feld Entertainment, the circus' parent company, announced in January that the show would be coming to an end, citing changing public tastes and declining ticket sales after the company retired its elephants in May 2016 following a decades-long battle with animal rights groups. Circus enthusiasts said coming to the show's grand finale was bittersweet, but they came to witness the "historic" moment and support the artists. Kurt Spence, a member of Circus Fans Association of America (CFA), said he came from Doylestown, Pennsylvania, to say goodbye to the circus he had loved since childhood. "I was 9 years old when my grandfather took me to 'The Greatest Show on Earth' under a tent just days before it closed in Pittsburgh, and that was 61 years ago," he said. "For a circus fan, this is a monumental occasion," he said. "This is historic." CFA President Gary Payne said through tears before the final show that while he looked forward to seeing what the industry did next, the Ringling Bros. circus "cannot be replaced." 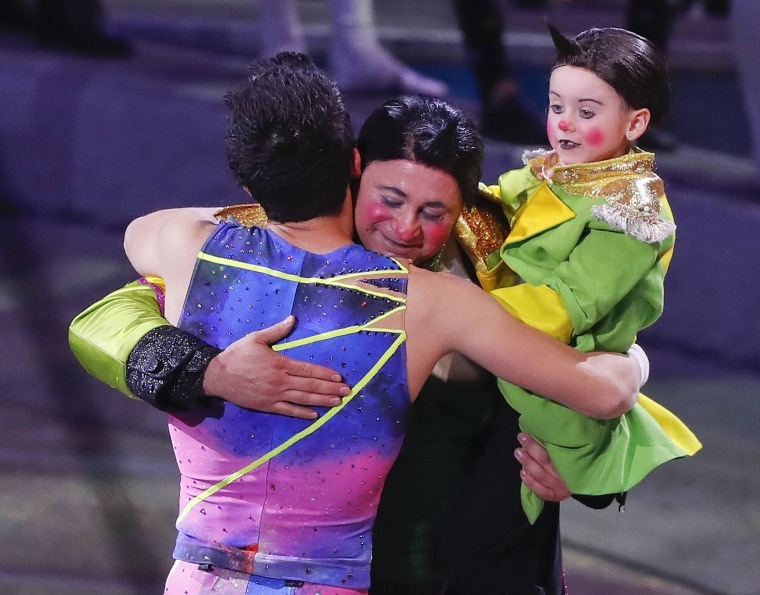 Attending the finale brought closure to Joel Davis, who said he worked in the props department and as an electrician for Ringling Bros. in the 1980s and came from Los Angles for Sunday night's performance. "Once you get this in your system, it does not leave you," he said. "It's going to be there until the day you leave the Earth." But activists said the show's closing represented a "hard-fought victory" for animal rights. Dozens of protesters lined the show's main entrance Sunday afternoon, some dressed in lion and tiger costumes and others waving signs. "This is a tremendous victory, and it's been hard-fought, but there are still a lot of other circuses using animals, so we're here not just to celebrate, but to also send a message to the other circuses that if they don't evolve, they're going to be next," said John Di Leonardo, president of Long Island Orchestrating for Nature (LION) and a campaigner for People for the Ethical Treatment fo Animals. "Boycott the circus! Teach your children compassion, not oppression!" he chanted into a megaphone as cars drove into Nassau Coliseum. Di Leonardo said activists were also calling on Ringling Bros. to send all of its animals, including its retired elephants, to reputable sanctuaries, taking issue with the company's decision to retire its elephants to its company-owned 200-acre Center for Elephant Conservation in Florida. Pat Cuviello, of the San Francisco area, said he had been organizing anti-circus protests for decades and had to come out to for the last show. "It took 30 years, but it finally happened," he said, adding, "This is a total victory." Famed animal trainer Alexander Lacey addressed the controversy head-on on Sunday while performing with his dozen tigers and lions. "It's so, so important that if you love animals as much as I do that you have to keep supporting the people that dedicate their lives to these animals," he said. "Support good, well-run circuses," he said. "Support good, well-run zoos." Feld Entertainment and the circus' workers have repeatedly denied mistreating animals, and the company has said it has found homes for all of the 50 or so animals with the show. Any animals that are owned by the show's presenters will remain with them, including Lacey's famous big cats, while the show's other tigers will go to a center that specializes in tigers, company spokesman Stephen Payne told NBC News earlier this week. Payne said that because of privacy concerns, the company isn't releasing specific information on where all the animals are going, but he insisted that they had to meet Feld's standards for a "high level of care." The final performance began with members of the Feld family addressing the audience and thanking the circus' 300 workers and performers for their time with the company. "It's always been our goal to be able to share with families the incredible experience — the joy, the happiness and the wonderment of 'The Greatest Show on Earth,'" said Kenneth Feld, the company's chief executive. Elisha Maybank of Amityville, New York, said she came so her children could experience the show before it was gone for good. "I was able to see it when I was younger, so it's good that my kids were able to see the show for the last time," she said after the performance. "You know, if you have any children after this, they'll never be able to experience this at all." Leshawn Maybank, 5, said he had an "awesome" time at the show — his favorite part was the BMX-bike stunts. Ringmaster Iverson appeared beside his own family at the end of the show and thanked the audience to deafening applause. "We hope the memories we've made together will last you a lifetime," Iverson said, adding: "Thank you. Keep the circus alive inside you."